After months of protest marches, court hearings, and marathon legislative sessions, Governor Scott Walker’s law that rolls back the ability to collectively bargain for many state workers officially takes effect today. It’s been a historic journey for the measure to get to this point, as it has worked its way through the Legislature and the courts in a battle like no other in recent memory. It has left many in the state divided and will likely impact the political landscape of Wisconsin for the next several years. The measure, which the governor argued was needed to help the state and local governments get employee costs under control, eliminates most collective bargaining for public employees and requires workers to make greater contributions to their pensions and health benefits. Walker introduced the bill in mid-February as part of a budget repair bill that Republicans hoped to push quickly through the Legislature. 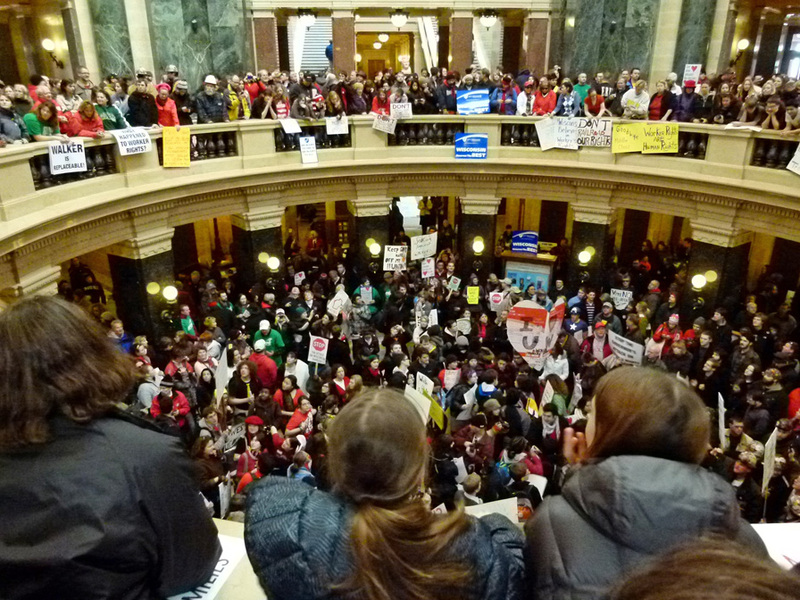 The first sign of the protests to come at the Capitol came on February 14th, when University of Wisconsin students and employees delivered Valentine’s to the governor’s office asking him to reconsider. The next day, crowds grew as the Joint Finance Committee opened a hearing on the measure that ran well into the early hours of the next morning. The all night hearing of the JFC opened the door for what became a round the clock occupation of the Capitol building by those opposed to the bill. Thousands of protesters began filling the building each day and many slept inside over night, while crowds that peaked at over 100,000 marched around the Capitol in the weeks that followed. The demonstrations drew attention from around the world and numerous celebrities came to help rally with those opposed to the governor’s plan. The chaos surrounding the protests resulted in a massive law enforcement presence at the Capitol. Several times, the building was put on lockdown by the state in an attempt to regain control of the situation. For several months, the public was not allowed to enter the building without first going through security screening stations at limited designated entrances. 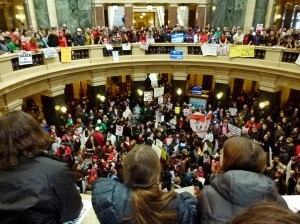 The security measures resulted in a lawsuit from labor groups, who claimed they were being denied access to the Capitol. A Dane County judge ordered the building fully reopened to the public in early March, but it was not until the last week that metal detectors came down and all doors were opened to the public again. The state has defended the decision to tighten security at the Capitol as a necessary move to protect lawmakers and those working inside the building, following threats to several lawmakers and their families. While the protests raged on, Republican lawmakers faced numerous hurdles in their efforts to pass the bill. As the Senate came to the floor to take it up that week, it was discovered that all 14 Senate Democrats had left the state to stop a vote. Their absence left the Senate without the quorum needed to pass the bill because of its fiscal elements. Democrats remained in Illinois for three weeks. Some members attempted to reach out to work on a compromise on the bill, but Republicans and Governor Walker held fast on the proposal. The Assembly even took the bill to the floor on its own, debating the measure for more than 60 hours before passing the measure. After almost three weeks of waiting for the Senate Democrats to return, Republicans suddenly called a conference committee on the bill in March to remove the fiscal provisions. The move allowed the Senate to vote on the bill without Democrats present. The bill then went to the Assembly the next day, which approved it after debate was limited to just a few hours. The Governor quickly signed the bill, but the fight was far from over. Dane County District Attorney Ismael Ozanne filed a lawsuit claiming Republicans violated the state’s Open Meetings Law when they called the conference committee meeting with less than two hours notice. The state attempted to battle the lawsuit with claims that GOP lawmakers had immunity from prosecution and that the court did not have the power to undo passage of the bill. However Dane County Judge Maryann Sumi ruled that their action violated the law and, as a result, the passage of the measure was void. The state pushed quickly for the Supreme Court to take up the issue. Arguments on the case were heard earlier this month. Then, just as Republicans faced the possibility of adding the collective bargaining language to the state budget, a divided court issued a majority opinion overturning Sumi’s ruling and clearing the way for the bill to become law. The battle is far from over though. Recall elections now loom over nine members of the state Senate. While court challenges to those races are pending, primaries are scheduled for this month and most senators will face recall elections in August. Labor groups have also filed suit in federal court to stop the law, claiming it violates their First Amendment right to free assembly. If that effort fails, other lawsuits are expected.